Companies may issue different types of stock. For example, some companies have multiple classes of common stock. A “family business” that has grown very large and become a public company may be accompanied by the creation of Class A stock (held by the family members) and Class B stock (held by the public), where only the Class A stock can vote. This enables raising needed capital but preserves the ability to control and direct the company. While common stock is the most typical, another way to gain access to capital is by issuing preferred stock. The customary features of common and preferred stock differ, providing some advantages and disadvantages for each. The following tables reveal general features that can be modified on a company by company basis. Receives a portion of dividends that are declared and issued to common shareholders. The right to vote on certain general governance matters like election of the board of directors, employee stock award plans, mergers, and similar corporate matters. Receives proceeds of liquidation after creditors and other priority claims are settled. The right to periodic financial reports about corporate performance. Paid a dividend prior to any distribution to common stockholders, and the dividend is more or less expected each period. The amount of the dividend is usually stated as a percentage of the preferred stock’s “par value.” Furthermore, preferred stock is frequently cumulative; if the annual dividend requirement cannot be satisfied, it will become a dividend in arrears, and all dividends in arrears must be paid before any dividends can be paid to common shareholders (in contrast to “noncumulative” where a missed dividend is not required to be made up in the future). In the event of a corporate liquidation, to be “paid-off” before common shareholders. Of course, creditors must first be satisfied before any funds will flow to either the preferred or common stockholders. Can be forced to cash out in exchange for a preagreed “call price” that is oftentimes set at a certain percentage of “par value” (e.g., callable at 105, would mean the company can buy back the preferred stock at 105% of its par value). A call provision can effectively limit the upside value of an investment in preferred stock. May be exchanged for common stock at a preagreed ratio (e.g., 3 shares of common for 1 share of preferred). A convertible preferred stock can effectively provide significant upside potential if the related common stock increases value. Intent to be bought back by the company (“mandatory redeemable”) on a certain future date. A comparative review of the preceding tables reveals a broad range of potential attributes. Every company has different financing and tax considerations and will tailor its package of features to match those issues. For instance, a company can issue preferred that is much like debt (cumulative, mandatory redeemable), because a fixed periodic payment must occur each period with a fixed amount due at maturity. On the other hand, some preferred will behave more like common stock (noncallable, noncumulative, convertible). In the preceding discussion, there were several references to par value. 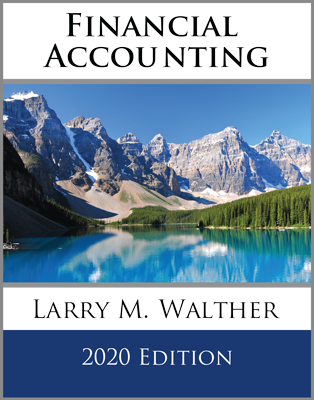 Many states require that stock have a designated par value (or in some cases “stated value”). Thus, par value is said to represent the “legal capital” of the firm. In theory, original purchasers of stock are contingently liable to the company for the difference between the issue price and par value if the stock is issued at less than par. However, as a practical matter, par values on common stock are set well below the issue price, negating any practical effect of this latent provision. Occasionally, a corporation may issue no-par stock, which is recorded by debiting Cash and crediting Common Stock for the issue price. A separate Paid-in Capital in Excess of Par account is not needed. Sometimes, stock may be issued for land or other tangible assets, in which case the debit in the preceding entry would be to the specific asset account (e.g., Land instead of Cash). When stock is issued for noncash assets, the amount of the entry would be based upon the fair value of the asset (or the fair value of the stock if it can be more clearly determined). In observing the preceding entry, it is imperative to note that the declaration on July 1 establishes a liability to the shareholders that is legally enforceable. Therefore, a liability is recorded on the books at the time of declaration. 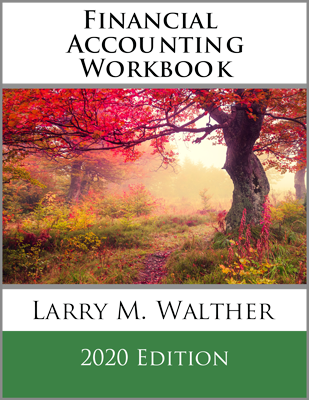 Recall (from earlier chapters) that the Dividends account will directly reduce retained earnings (it is not an expense in calculating income; it is a distribution of income)! When the previously declared dividends are paid, the appropriate entry would require a debit to Dividends Payable and a credit to Cash. Some shareholders may sell their stock between the date of declaration and the date of payment. Who is to get the dividend? The former shareholder or the new shareholder? To resolve this question, the board will also set a “date of record;” the dividend will be paid to whomever the owner of record is on the date of record. In the preceding illustration, the date of record might have been set as August 1, for example. To further confuse matters, there may be a slight lag of just a few days between the time a share exchange occurs and the company records are updated. As a result, the date of record is usually slightly preceded by an ex-dividend date. The practical effect of the ex-dividend date is simple: if a shareholder on the date of declaration continues to hold the stock at least through the ex-dividend date, that shareholder will get the dividend. But, if the shareholder sells the stock before the ex-dividend date, the new shareholder can expect the dividend. In the illustrated time line, if one were to own stock on the date of declaration, that person must hold the stock at least until the “green period” to be entitled to receive payment. Recall that preferred dividends are expected to be paid before common dividends, and those dividends are usually a fixed amount (e.g., a percentage of the preferred’s par value). 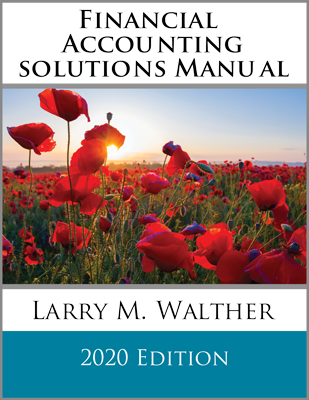 In addition, recall that cumulative preferred requires that unpaid dividends become “dividends in arrears.” Dividends in arrears must also be paid before any distributions to common can occur. The following illustration will provide the answer to questions about how these concepts are to be implemented. To develop the illustration, begin by looking at the equity section of Embassy Corporation’s balance sheet. Note that this section of the balance sheet is quite extensive. A corporation’s stockholders’ equity (or related footnotes) should include rather detailed descriptions of the type of stock outstanding and its basic features. This will include mention of the number of shares authorized (permitted to be issued), issued (actually issued), and outstanding (issued minus any shares reacquired by the company). In addition, be aware of certain related terminology: legal capital is the total par value ($20,400,000 for Embassy), and total paid-in capital is the legal capital plus amounts paid in excess of par values ($56,400,000 for Embassy). 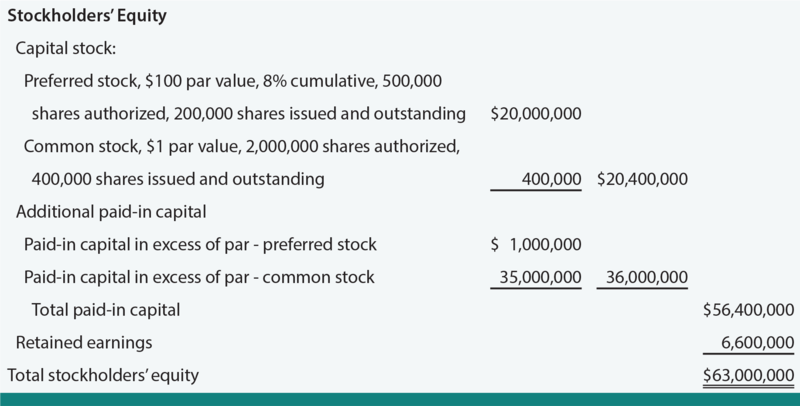 Note that the par value for each class of stock is the number of shares issued multiplied by the par value per share (e.g., 200,000 shares X $100 per share = $20,000,000). The preferred stock description makes it clear that the $100 par stock is 8% cumulative. This means that each share will receive $8 per year in dividends, and any “missed” dividends become dividends in arrears. If the notes to the financial statements appropriately indicate that Embassy has not managed to pay its dividends for the preceding two years, and Embassy desired to pay $5,000,000 of total dividends during the current year, how much would be available to the common shareholders? The answer is only $200,000 (or $0.50 per share for the 400,000 common shares). The reason is that the preferred stock is to receive annual dividends of $1,600,000 ($8 per share X 200,000 preferred shares), and three years must be paid consisting of the two years in arrears and the current year requirement ($1,600,000 X 3 years = $4,800,000 to preferred, leaving only $200,000 for common). Distinguish between common and preferred stocks, carefully detailing the rights and features of each class. What is the significance of par value? Be able to prepare complete journal entries to record the issuance of par value stock. How is stock accounted for that is issued for assets other than cash? Describe the important dates that pertain to dividends. When are journal entries recorded for dividend transactions? How are declared but unpaid dividends reported in the financial statements? Be able to prepare a complete stockholders’ equity section for a corporate entity. Note the thorough nature of the capital stock descriptions on the face of the balance sheet. Be able to perform dividend calculations in cases involving cumulative and noncumulative preferred stock.